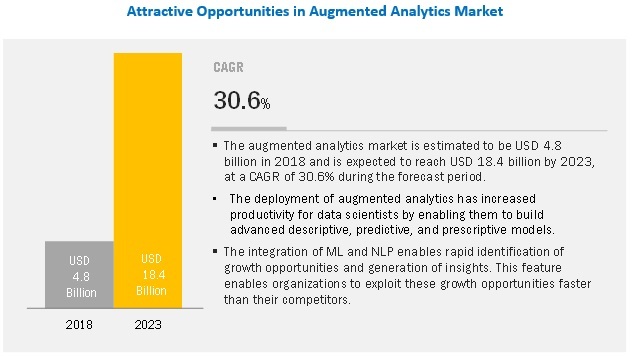 [121 Pages Report] The global augmented analytics market size is expected to grow from USD 4.8 billion in 2018 to USD 18.4 billion by 2023, at a Compound Annual Growth Rate (CAGR) of 30.6% during the forecast period. Major growth drivers for the market include increasing volume of complex data and growing adoption of advanced business analytics tools. The report provides detailed insights into the market software, service (training and consulting, deployment and integration, and support and maintenance), organization size, deployment type, vertical, and region. To compete with large organizations, SMEs are expected to adopt augmented analytics solutions at a higher rate during the forecast period to enhance operational productivity and maximize profits through appropriate assessment of data. Augmented analytics helps SMEs to monitor the growth of their businesses and generate insights to deal with their future prospects. However, SMEs are unable to deal with a huge amount of data sets due to budget constraints, which leaves them with limited ways to market themselves and gain visibility, further compelling them to invest in augmented analytics solutions. North America is expected to hold the largest market size during the forecast period in the augmented analytics market, owing to the early adoption and innovative initiatives for advanced analytics solutions and practices, such as Natural Language Processing (NLP), ML, and smart data preparation and discovery. The factors driving the growth of augmented analytics software and services are state-of-the-art infrastructure, high funding opportunities, widespread customer base across several industries, conducive environment for innovation, and availability of highly-skilled workforce. Major vendors in the global market include Salesforce (US), SAP (Germany), IBM (US), Microsoft (US), Oracle (US), Tableau (US), MicroStrategy (US), SAS (US), Qlik (US), TIBCO Software (US), Sisense (US), Information Builders (US), Yellowfin (Australia), ThoughtSpot (US), and Domo (US). Salesforce, a key player in the global market provides a comprehensive range of solutions. The company has adopted inorganic growth strategies to maintain its leading position in the global market. For instance, in September 2016, Salesforce acquired BeyondCore to enhance its analytics portfolio and strengthen the AI platform by extending smart data discovery and advanced analytics capabilities. In December 2018, Microsoft announced integration between Power BI dataflows and Azure Data Lake Storage Gen2. The integration enabled organizations to unify data across Power BI and Azure Data services. With this integration, the business analysts and BI professionals working in Power BI can easily collaborate with the data analysts, engineers, and scientists working in Azure. In October 2018, IBM partnered with Motio to accelerate the upgrades to Cognos Analytics 11.1. The Motio software is designed to enhance the development and administration processes for Cognos. This software would also help in the upgradation process. In September 2018, SAP added new ML feature to its SAP Analytics Cloud solution. This enhancement helped businesses uncover correlations in their data and assisted users in faster and better decision-making. What are the upcoming verticals for the augmented analytics market? The study involved 4 major steps to estimate the current market size of the augmented analytics market. Exhaustive secondary research was done to collect information about the market, the peer market, and the parent market. The next step was to validate these findings, assumptions, and sizing with industry experts across the value chain through primary research. Both top-down and bottom-up approaches were employed to estimate the complete market size. After that, the market breakup and data triangulation procedures were used to estimate the market size of the segments and subsegments. The market size for companies offering augmented analytics solutions and services was arrived at on the basis of the secondary data available through paid and unpaid sources, and by analyzing the product portfolios of the major companies in the ecosystem and rating them according to their performance and quality. In the secondary research process, various sources were referred to, for identifying and collecting information for this study. The secondary sources included annual reports, press releases and investor presentations of companies, white papers, journals, certified publications, and articles from recognized authors, directories, and databases. In the primary research process, various sources from both supply and demand sides were interviewed to obtain qualitative and quantitative information for making this report. The primary sources from the supply side included industry experts, such as Chief Executive Officers (CEOs), Vice Presidents (VPs), marketing directors, technology and innovation directors, and related key executives from various key companies and organizations operating in the augmented analytics market. After the complete market engineering (including calculations for market statistics, market breakup, market size estimations, market forecasting, and data triangulation), extensive primary research was conducted to gather information, and verify and validate the critical numbers arrived at. 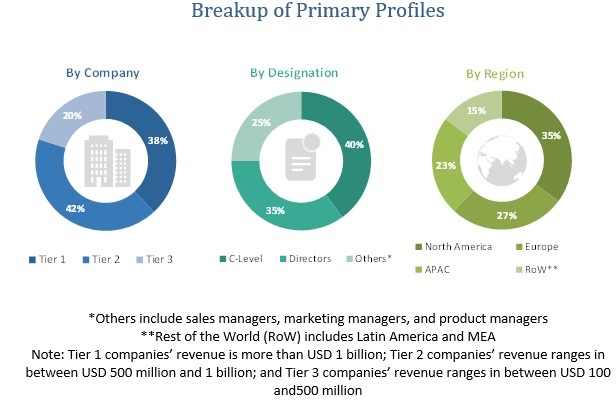 Primary research was also conducted to identify the segmentation types; the competitive landscape of augmented analytics solution and service providers; and key market dynamics, such as drivers, restraints, opportunities, challenges, industry trends, and key players’ strategies. After arriving at the overall market size using the market size estimation processes as explained above—the market was split into several segments and subsegments. To complete the overall market engineering process and arrive at the exact statistics of each market segment and subsegment, the data triangulation and market breakup procedures were employed, wherever applicable. The data was triangulated by studying several factors and trends from both, the demand and supply sides in the augmented analytics market.